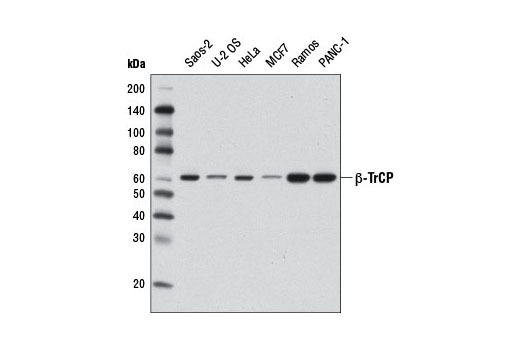 β-TrCP (D12C8) Rabbit mAb recognizes endogenous levels of total β-TrCP protein. Monoclonal antibody is produced by immunizing animals with a recombinant protein specific to human β-TrCP protein. β-transducin repeat-containing protein (β-TrCP or FBW1A) is an F-box family protein characterized by the presence of the protein-protein mediating F-box domain first described in cyclin F. F-box proteins act as substrate adaptors that target proteins containing a specific phosphorylated sequence element, referred to as a phosphodegron, to the SCF E3 ubiquitin ligase complex for ubiquitination (1,2). β-TrCP targets many important proteins with diverse functions, such as p53, H-Ras, Smad4, IκBα, β-catenin, and the cell cycle checkpoint protein claspin, for ubiquitin-mediated degradation (3-5). Research studies have shown that inhibition of β-TrCP expression has a demonstrated benefit in the treatment of prostate cancer (6). Bour, S. et al. (2001) J Biol Chem 276, 15920-8. Kusmierczyk, A.R. and Hochstrasser, M. (2008) Biol Chem 389, 1143-51. Wan, M. et al. (2004) J Biol Chem 279, 14484-7. Mailand, N. et al. (2006) Mol Cell 23, 307-18. Frescas, D. and Pagano, M. (2008) Nat Rev Cancer 8, 438-49. Gluschnaider, U. et al. (2010) PLoS One 5, e9060.